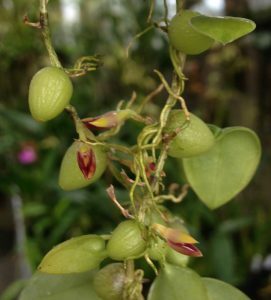 One of our smaller growing and flowering bulbophyllums is this species native to Malaysia, Java and Borneo. We grow the species mounted and it produces dangling stems of small single leaved pseudobulbs and flowers several times a year from the base of the pseudobulbs. The flowers are small but an attractive dark red and they a well worth a closer look.